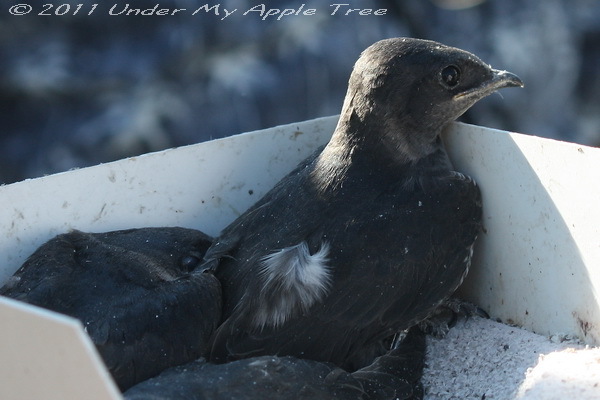 The Purple Martin is the largest of the North American Swallows. They can be found across most of the US and Southern Canada except for the interior mountain areas. Martins are unusual because they nest in colonies. 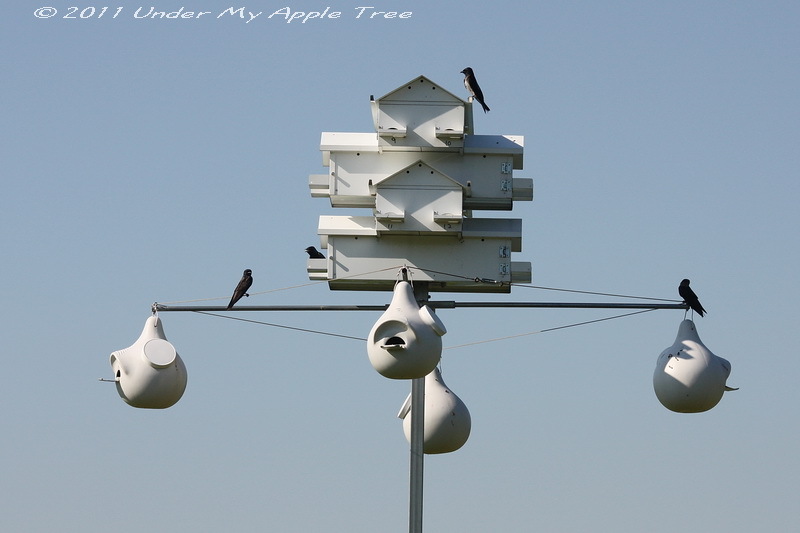 The eastern Martins nest almost exclusively in man made multi-unit birdhouses like the one below and are now dependent on humans to provide them with nesting sites. Part of last month’s birdwalk was a presentation on Purple Martins. This Martin house is on a golf course and is monitored by a volunteer from the bird club. It’s on a retractable pole and can be brought down to ground level allowing monitoring and an up close look into the nests. This group of Martins is accustomed to people and did not appear upset that we were looking at their little ones. They gathered on several of the roosting poles and observed us observing them. Above are two photos of the nests. The first one only has eggs. The second one has older nestlings that will soon be leaving. There are three youngsters in there. Two are hiding but one curious bird sat up to look around. (Click photos for sharper images). The parents were patiently waiting for us to leave so they could resume caring for their youngsters. They were sitting high up on one of the roosting poles. The dark glossy bird is the male, the female has whitish underparts. If you look closely you can see they are holding a meal of bugs in their beaks for the hungry babies. 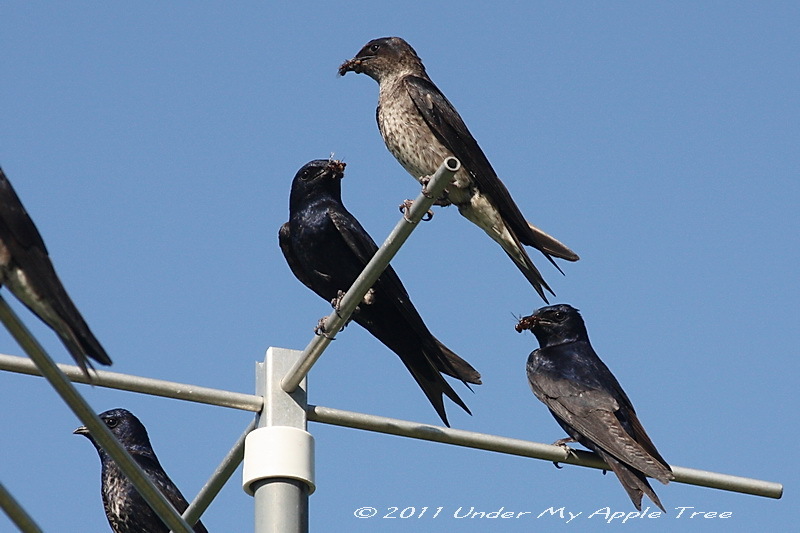 The Purple Martin eats flying insects which it catches in flight. Birds in Eastern North America now nest almost exclusively in birdhouses, but those in the West use mostly natural cavities. The male and female build the nest and feed the young and the couples are monogamous. Only the female incubates the eggs. Native Americans hung up empty gourds for these birds to nest in before Europeans arrived in North America. It is theorized that the Martins kept the Crows away from their corn crop. The Martins spend their winters in Brazil and return to the same nesting area each spring. The Purple Martin Conservation Association supports the study of the Purple Martin, and has more information available on its web site. This was very interesting thanks for sharing. Didn’t know the birds are already accustomed to people. They probably thought it was a nest check day. The apartments (I like to call them bird condos) are numbered and the monitor quickly checks each nest about once a week and counts the number of eggs or young. Checking does not cause the birds to abandon the nest and in fact helps them as problems with parasites, predators or damaged nests can be corrected. Oh that’s so sad. But I’m glad that some people are obviously very committed to helping preserve them. Thanks for such an interesting post. While they are not endangered, in some areas populations are declining. Without these very dedicated people the birds would have a much harder time. What amazing little birds. The male with all his shiny purple plumage looks especially regal! This was really interesting. Thanks for sharing! That is an amazing birdhouse! Great pictures – love birds. Thanks for sharing the interesting facts, too. I do love seeing your bird photos and hearing more about them. I love birdhouses! I don’t know that any birds nest in mine (I only have one outside on the patio), but whenever I see outdoor birdhouses, I’m reminded of a scene from a movie supposedly set in Seattle—The Hand That Rocks the Cradle—in which one of the characters is erecting a birdhouse in the yard for the Martens, since they return every year. Once a colony is established the birds will return every year. Not sure I saw that movie. Your pictures are fantastic as usual. I’m amazed that the birds let you look at their nests so closely. Some birds would not be happy at all and would want to poke your eyes out! These have gotten used to the nest checks. I too was surprised that the parents just roosted on the pole and watched us. We were there for about 20 minutes. Until I attended this presentation I had never seen them up close before or was able to get photos… they fly high and fast. Absolutely amazing – photos and information. Your photos and information again are fascinating. I learn so much and I’m blown away by your snapshots. Awww that’s too bad. Nova Scotia is the northern edge of their range so it is possible they may come back if they find housing. I don’t think I’ve ever seen one before. My dad was a lover of books, he was always reading, usually a western or thriller. But after he passed away I found a book about birds among his things. I am finding that lots of people enjoy birds… nice to see your dad was one of them. I’ve heard of purple martins but never seen them. I’ve never heard of the difference in how birds nest in the east and west. I know that my kids have made bird houses (and I remember making some when I was a kid too) none of which drew any birds. I have one house that birds avoided for years. 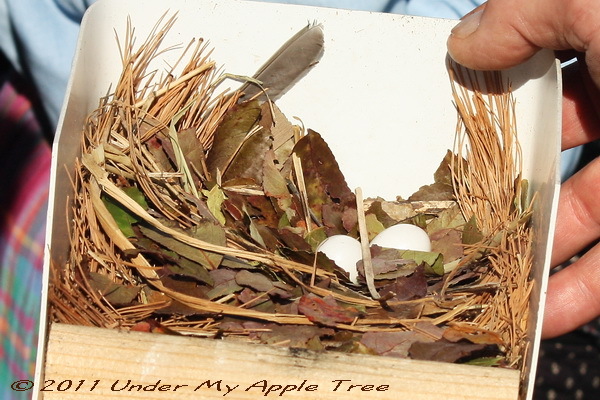 I finally found out why… the size of the opening was 1 1/8 inches, slightly too small for sparrows or finches but perfect for wrens and chickadees. But it took the wrens a few years to find the house. Now I have wrens every year. Interesting post…and great pictures…thanks for sharing. I’m learning little by little that some birds don’;t see to mind us humans, but others, like Cardinals are pretty standoffish. (Got a few more bird photos last week – will post next Saturday). I love the photos and info about the Purple Martins. (i got a copy of that bird book for beginners you mentioned — it’s great. That really is a great book. Which reminds me, I should get my review of it posted. Cardinals are one of my toughest subjects… the only way to photograph them is to hide. If they see me, they leave. Leslie, you could publish a book about a birds. Thank you for sharing your beautiful photos and all of this info.